Our dye sublimated cheerleading uniforms from Maxxim Sports are made out of poly/spandex two-way rib knit interlock material and custom designed with team name and logo directly imprinted into the fabric. No need to purchase additional lettering for your uniform as everything is included in the base price. 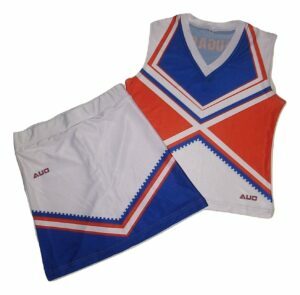 These lightweight uniforms are a great budget friendly choice for your cheer or dance team. Maxxim Sports cheer skirt come with built in shorts.